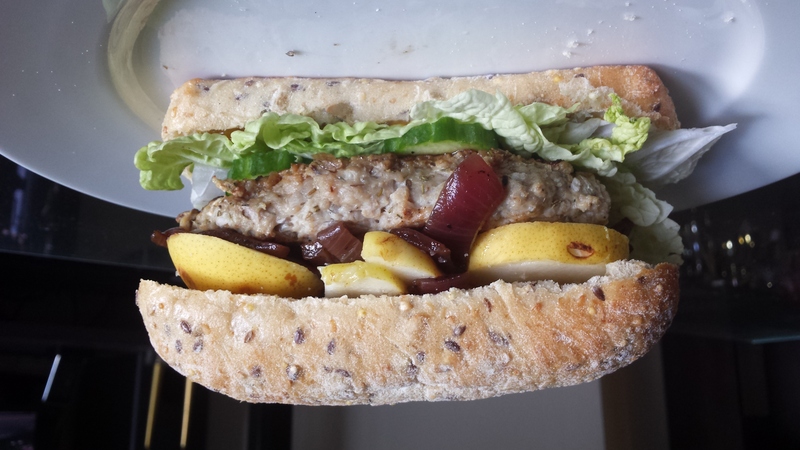 Mango chutney, Pear and caramelized red onion flavor this easy to make turkey burger that is a perfect Pre workout Meal. Finely chop enough onion rounds to equal 1/3 cup. Combine the chopped onion with turkey, and salt in a food processor. Form into a burger about 1/2 inch thick and rectangle shaped to match the shape of the bread. To assemble sandwiches, spread the mango chutney on the bottom piece of baguette. Top with lettuce, cucumber, turkey burger, caremelized onion, Sliced Pear . Cover with the remaining bread.